"Hello again, friends! Today I have a gift for you - the Loulouthi Tiles quilt pattern in handy dandy PDF form. Feel free to download any or all sizes you like and save them to your computer for personal use. 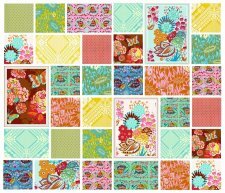 Each pattern includes supplies, cutting and piecing directions, with links to other helpful info like my hand-quilting tutorial." Check out Rachel's Free Tutorials page!